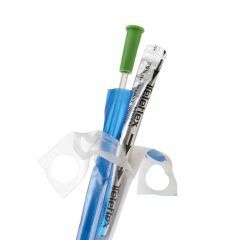 FloCath Quick™ Hydrophilic Intermittent Catheters, Female, 7"
The FloCath® Quick™hydrophilic female intermittent catheter is packaged with an integrated saline pouch and patented protective catheter sleeve. The integrated package contains a FloCath Hydrophilic Catheter with our patented handling sheath and a packet of sterile 0.9% saline. The FloCath® Quick allows for complete sterile catheterization. The Rüsch® FloCath Quick ™ Hydrophilic Intermittent Catheter is an "all-in-one" intermittent catheter providing the ultimate convenience. Before opening, break the sterile saline pouch to hydrate the catheter. Sterile saline is much closer to the body's natural fluids than sterile water, and the extremely lubricious coating allows for a comfortable insertion. The handling sheath provides an easy grip, allowing for touchless insertion. The sheath can also be pushed back and used as an extension to the catheter.